Having a home office is becoming a more common option – even in the Ag Industry. With territories growing and companies expanding, the flexibility this allows is offering more convenience for the employee and growing sales opportunities for the company! Studies have shown that working from home can improve workers’ productivity. But working remotely can pose some challenges – biggest being how to stay focused. Because when you’re working from the comfort of home, it can be easy to become distracted by your everyday life and let work slide to the back burner. Here are a few tips to boost your remote workday focus factor and really get things done! Have a dedicated work space. Giving yourself a space set aside specifically for work can help train your mind to enter into a productivity mindset. 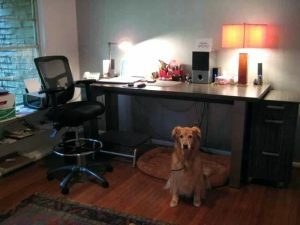 Also – having a dedicated space to work means you can set it up in a way that’s most conducive to your work style – whether that’s using multiple monitors, a standing desk, base boosting computer speakers – whatever you need to create the most productive work! As tempting as it can be to stay in your comfy pajamas all day, what you wear can greatly affect your mindset. Dress for success! Put yourself together as though you were going out – look the part! Allow for MOVEMENT in your day. Sometimes the best thing you can do to gain or regain focus is to take a walk or hit the gym. Not only does physical movement and exercise make you fell better – it can clear your head and give you some fresh perspective and focus. Set a scheduled work hours – and stick to them! Working remotely means your work is always there and that can make it tough to know when enough is enough. If you want to maintain your happiness, focus and avoid burnout, make sure you set your work hours and stick to them! Knowing when it’s time to “clock-out” will provide the much needed work-life balance and give you time to recharge so you can be ready to start the next day fresh and focused. Make a daily list of “things to do”. DISTRACTIONS are everywhere and when you work from home, it’s very easy to stray from what needs to get done. Making a list can help your mind stay on task and get the most important things done. Be intentional about being social! One thing many employees that work remotely tend to miss is the workplace chatter – or any socializing for that matter. Working from home can be isolating and lonely if you aren’t intentional about being social. Take breaks and reach out to a few people – schedule a lunch date, make a phone call, meet a friend for a walk. Remote working can be an amazingly rewarding and very productive experience that brings a sense of freedom with it. But the key is to DO IT RIGHT! Get intentional by incorporating some of these tips into your own life and set your mind to be successful – wherever you have your office! ← Here’s to 2019 – a New Beginning!